If you’ve stepped off the conventional paper trail for faster, more efficient electronic recordkeeping, congratulations! You’ve taken a smart, timesaving approach to the type of “busy work” most small business owners and managers dread. But just because you’ve put paper in the past doesn’t mean you can ignore the rules. Shifting from paper to online recordkeeping offers numerous advantages, but it still comes with specific requirements. By following a handful of essential do’s and don’ts, your switch to electronic HR record management can be smooth and successful. DO keep files confidential at all times. Control who can access documents — and take precautions with strong security settings, password protection and data encryption. DO take the time to consider retrieval and searches when designing storage protocols. You want to make sure documents can be easily found if needed. DO implement a personnel file-access policy that complies with state and local law. In some states, employees have the right to view their personnel files upon request. In other jurisdictions, employers can make their own rules or even restrict access altogether. DO brush up on the laws. Federal and state agencies are increasingly permitting electronic personnel records. For example, the DHS lets employers fill out and store I-9 forms electronically, the EEOC has approved electronic records for Title VII, ADA, and ADEA documents, and ERISA regulations allow for electronic recordkeeping. Also, the federal E-SIGN law generally makes electronic signatures and contracts just as legal and enforceable as paper contracts that are manually signed with ink. DON’T keep documents beyond the legal deadline. Know the retention guidelines, and properly discard documents after the deadline has passed. Keeping certain documents, like the Form I-9, past the required timeframe can count against your business in the event of a lawsuit or government audit. DON’T wait to enter or upload new employee information. Schedule time at the end of each day or week to avoid falling behind with recordkeeping updates. DON’T destroy paper copies if you’re involved in a lawsuit. You can still scan and electronically store them during this time, but you need to retain the paper copy until the legal matter is resolved. DON’T cut corners. If you’re ever unsure if you’re complying with federal and state laws, consult an attorney for guidance. DON’T get frustrated during the transition to paperless. Implementation takes time. You may want to create documentation to distribute to your staff that answers common questions and sets protocol. 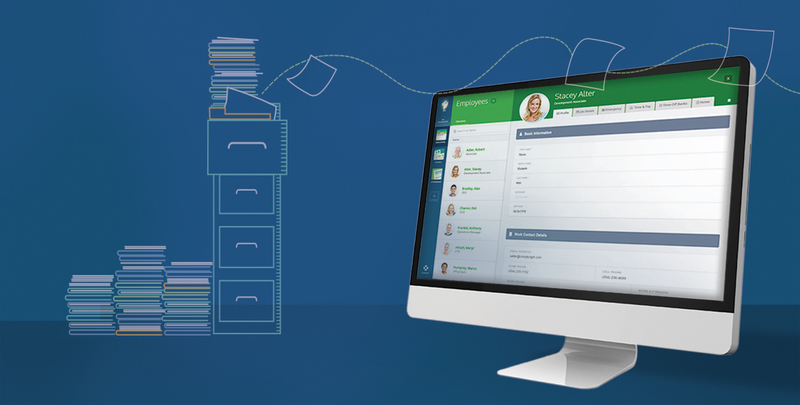 Ready for the easiest, most efficient way to manage employee records? Take advantage of the FREE Employee Records Smart App to keep employee information organized, secure and always at your fingertips. It only takes a few minutes to get started — and then you’ll be well on your way to smarter, more centralized electronic recordkeeping.